NO PREP and Common Core aligned! GO DIGITAL! Choose printed or paperless resources! 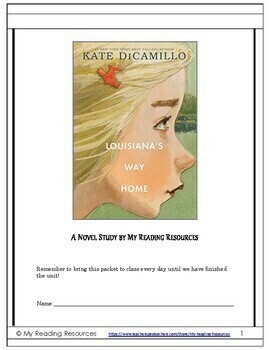 The 37-page student packet is perfect for literature circles or independent work. 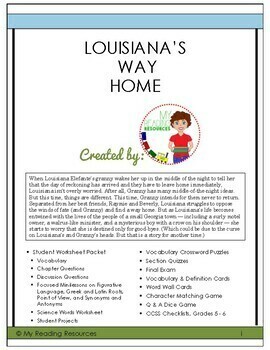 This novel study teaching unit has everything that you will need to teach and assess the novel. 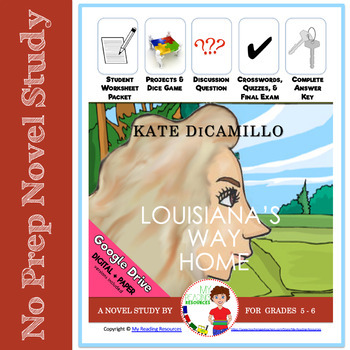 This is a 140+page, Common Core aligned, no prep novel study for Louisiana’s Way Home by Kate DiCamillo. 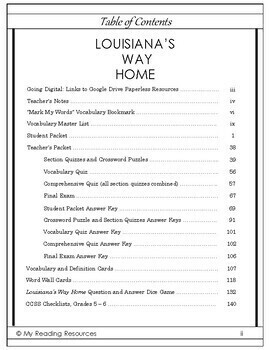 The student packet is available as a Google Slides file and the section quizzes and final exam are available as self-grading Google Forms files. A vocabulary and definitions list is also included to allow you to easily import into Flippity, Kahoot, Quizlet, etc. to create digital flashcards or word games. The table of contents makes finding information quick and easy. ALL ANSWER KEYS ARE INCLUDED.